At the Heart of Benedictine Spirituality is the Search for God. This search happens every day of the Monk's Life. Benedictines at Newark Abbey seek God primarily in the monastery through The Divine Office, the Mass, Lectio Divina, work in service St. Benedict's Prep and St. Mary's Church and the community of Newark. Our Commitment to living, praying, and working in this community for our entire lives (Stability) is a hallmark of Benedictine Spirituality. 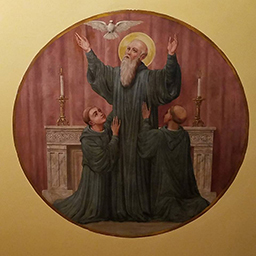 Our life of prayer and work (Ora et Labora) which helps to channel our search for God in a balanced and healthy way, can only be successful when lived in a community under our Abbot and The Rule of Saint Benedict as Guide.